Nigeria have the quality to overcome France in the World Cup Round of 16 match coming up in Brasil on Monday (today), President of Nigeria Football Federation, Aminu Mohammed Maigari, has said. According to Maigari, “We are not done yet. I can tell you that the Super Eagles will overcome France on Monday and that will be another glorious record,” he said as he flew out of Sao Paulo to Brasilia on Sunday morning. 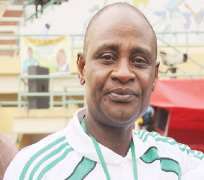 Maigari who turned 58 on Wednesday said the Super Eagles had a marvelous game against two–time world champions Argentina to qualify for the FIFA World Cup Round of 16 for the first time in 16 years, and defeat of France on Monday will mean a first–ever World Cup quarter–final for the world's most populous black nation. “I have confidence that we will beat France. If you have followed our campaign well, you would notice that we have improved match after match. We came close to upsetting Argentina in Porto Alegre. We do not fear France,” Maigari told reporters at the local wing of Guarulhos Airport. The Eagles have become a much better brand over the past two years, on the back of collective hard work by the federation, players and technical crew and a diligence that has ensured 26 friendly matches for the team since they left the 2010 FIFA World Cup finals in South Africa with damp wings. After earning four points in the group phase to come second behind perennial foes Argentina and a berth in the knock–out rounds, Nigeria stand to play at football's most renowned temple, Estadio Maracana, if they conquer the Les Bleus on Monday. Monday's match kicks off at 5pm Nigeria time (1pm Brasilia time).